Working with the greatest architects of the 20th century, such as Eero Saarinen, Gordon Bunshaft, I.M. Pei, Minoru Yamasaki and Edward Durell Stone, Harry Bertoia created more than fifty large-scale sculptures in prominent public spaces located in cities throughout the United States and around the world (Norway, Venezuela). Like his private works, Bertoia’s commissioned sculptures are aesthetic objects that explore natural phenomena such as light, motion and sound. Much larger in scale, these works function within the broader constraints of architecture, transforming and interacting within the spaces in which they reside. Bertoia’s first large-scale commission was completed in 1953 for the General Motors Technical Center in Warren, Michigan designed by Eero Saarinen, a colleague and friend from his days at the Cranbook Academy of Art. 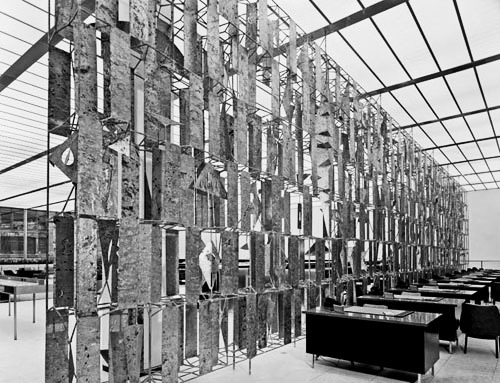 For this project, Bertoia created a Multi-Plane screen to separate the restaurant from the entryway of the interior. The welded screen, of brass melt-coated panels connected by rods, features alternating patterns of solids and voids that create a constantly shifting and beautiful play of lights and shadows while providing privacy for those behind it. 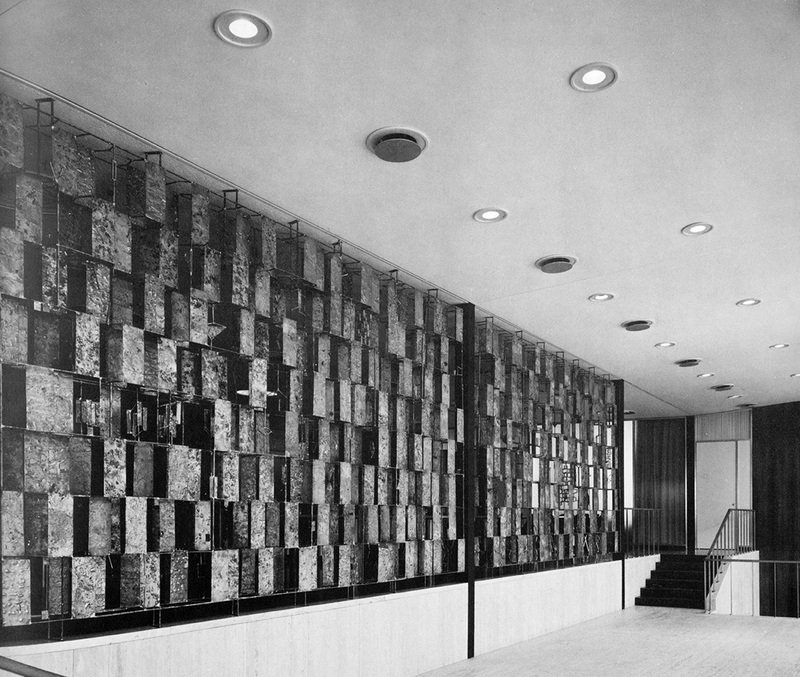 The following year Bertoia was commissioned by Gordon Bunshaft of Skidmore, Owings & Merrill for the Manufacturers Hanover Trust Company in New York to create a screen dividing the public and private sides of the bank’s main floor. This seminal Multi-Plane screen, nearly twice the size of the work he created for General Motors, located on 5th Avenue in New York, is widely admired and critically acclaimed; it has become the most recognizable work by Harry Bertoia. 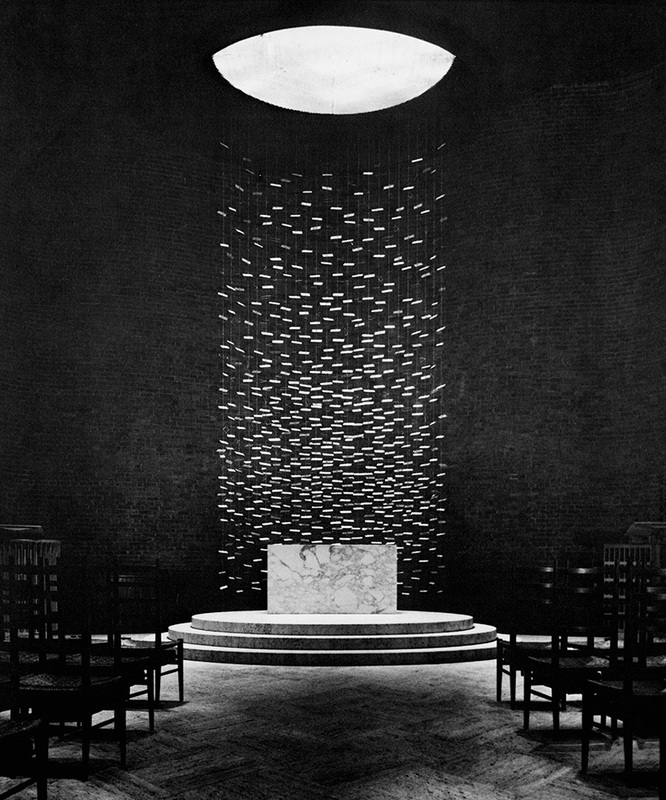 Also in 1954, Bertoia was invited to design a sculpture for the Chapel at the Massachusetts Institute of Technology in Cambridge, Massachusetts designed by Eero Saarinen. For the simple brick curved apse with a shell-dome ceiling, Bertoia suspended brass-melt coated panels and cut out shapes from twenty threads behind the altar. The individual elements, increasing in density as they near the floor, capture and reflect the light from the domed roof creating an ethereal experience. These early masterpieces opened the door to many significant sculptural commissions, both from friends and colleagues as well as other noteworthy architects, and to invitations to participate in internationally acclaimed exhibitions such as the World Fairs of 1957 in Brussels and 1964 in New York. 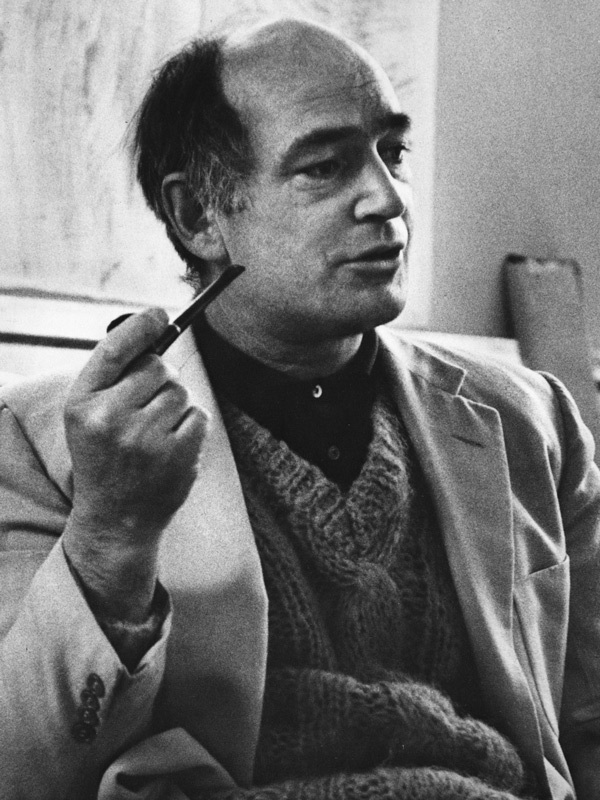 While many of Bertoia’s early large-scale forms were Multi-Plane screens, by the 1960s he was exploring other ideas for public sculpture which paralleled the techniques of his smaller scaled works. Significant projects such as his Dandelion fountain for the Joslyn Art Museum in Omaha, Nebraska (Stone 1963), a molten bronze mural for the Dulles International Airport in Chantilly, Virginia (Saarinen 1963) and a Welded Form fountain for the Civic Center in Philadelphia, Pennsylvania (Stone 1967) illustrate the depth and variety of Bertoia’s unique artistic vision. Bertoia repeatedly rose to the challenge of creating works that aligned with the architectural vision for a given space by creating works to highlight and complement the unique characteristics of their environments. 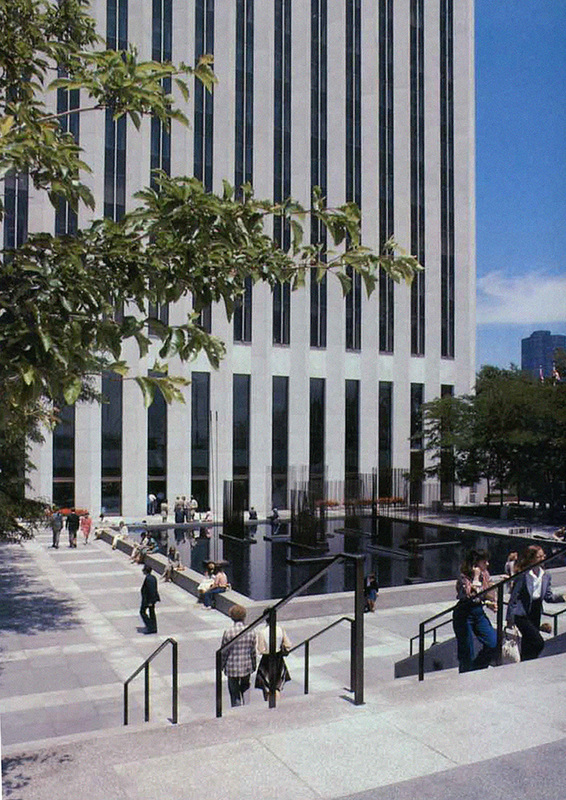 In 1974 Bertoia was commissioned to design a work for the plaza of the Standard Oil Building of Chicago (now the Aon Center) designed by Edward Durell Stone. Preceding the Sears Tower by one year, the starkly modernist skyscraper encased in Carrara marble was, for a short time, the tallest building in the Chicago skyline. 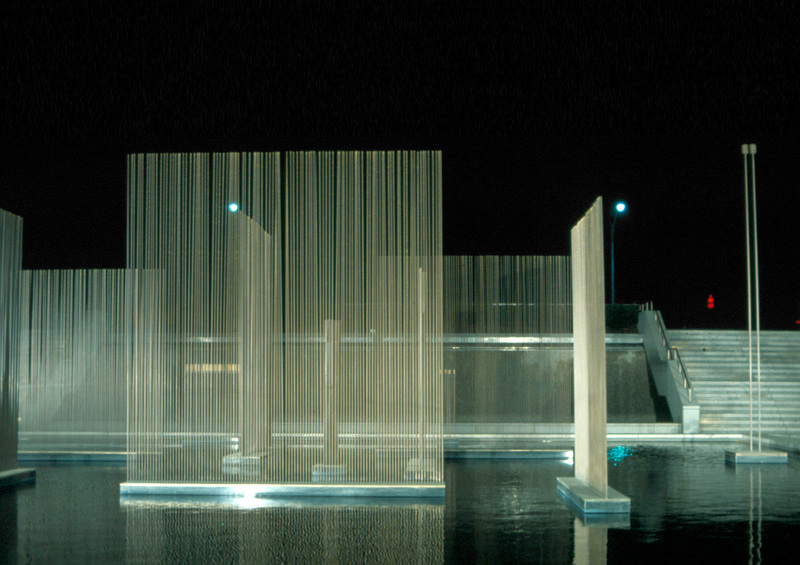 Mirroring the lakefront structure’s impressive height and verticality, Bertoia composed a collection of sounding sculptures that appeared to float in a 4,000 square foot reflecting pool at the base of the building. The installation included eleven geometrically arranged Sonambient sculptures, with rods aligned in straight rows or tightly clustered, ranging from four to sixteen feet in height. Architectural in size and energized by sunlight and the open air, the alternately arranged slender rods whispered tonal melodies while veiling and diffusing the view of the building and surrounding landscape - the overall experience is both mesmerizing and stimulating. No other works in Bertoia’s extensive oeuvre match the impressive scale of the Sonambients for the Standard Oil Commission. Sonambients at this scale have a visceral effect, multiplying and compounding optical illusions when seen through or in relation to one another. The single row composition of these masterworks carries an audible and visual wave across the surface, amplifying the unique characteristics of his sculpture. The Standard Oil Commission represents a crowning achievement of Bertoia’s large-scale public sculpture. Bertoia created these monumental works in his Pennsylvania studio, using scaffolding outdoors for the construction of the largest examples. Using 5,500 pounds of naval brass and 8,000 pounds of beryllium copper, Bertoia estimated that it would take roughly two weeks per sculpture to complete the works. By early 1975, the works were complete and ready to be transported to their Chicago home. More than a year in production and planning, the Sonambients were installed and dedicated on June 24, 1975. 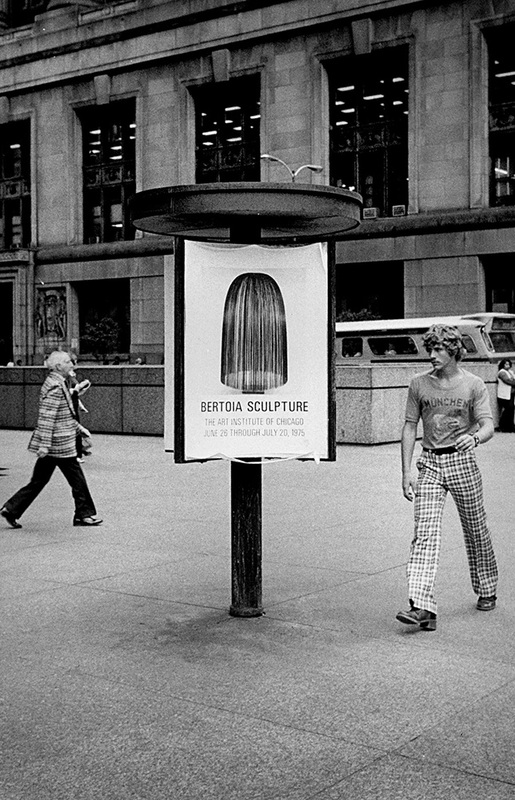 The Art Institute of Chicago and the Fairweather Hardin Gallery hosted exhibitions dedicated to the work of Harry Bertoia that ran concurrently with the unveiling of the Standard Oil commission. Directors and members of prominent Chicago corporations were in attendance as Mayor Daley, on behalf of the city, welcomed the addition of the fourth major public artwork to Chicago’s loop; Bertoia’s untitled (Sonambient) masterpiece for Standard Oil joined the Civic Center’s untitled monumental sculpture by Picasso, Chagall’s Four Seasons mural at the First National Bank Plaza and Calder’s Flamingo at the Federal Building.